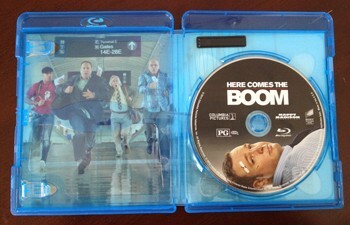 I briefly touched on the fact that Here Comes the Boom escalates in color as the film's progresses, where heavy, stony blues and oranges blossom into vigorous "true to life" colors in a way that underscores the growth of passion and determination around our hero. Sony's 1080p presentation of the 1.85:1-framed cinematography grapples with this shift in palette with immense agility, respecting the emotional tempo through a self-possessed projection of robust skin tones and depths of rich contrast -- aside from a few moments of ultra-deep black levels. Beads of sweat and the occasional stream of blood reveal a vigorous eye for detail during high-motion scenes, enhanced by a fierce grip on motion when Scott gets slammed around the ring, while a customary array of close-ups feed the eyes with details in clothing, skin textures, and the semi-rural Boston locations. This is stock modern cinematography handled with a clear, realistic perspective, and it looks exceptionally good in high-definition. The sounds of MMA cage matches and the training for said brawls dominate the 5.1 Master Audio presentation, elevating the roar of rowdy crowds and the smacks of bodies on the tarp with a suitable, engaging amount of force. Leading off with the noise of a motorcycle revving and the fluctuation of an orchestra's many components, the surround activity often immerses the audience in ambience, even if the design's direction naturally brings attention to the front-channels for the consistent dialogue. A few of the punches, kicks, and thumps rap against the lower-frequency channels, while the upper-level smacks of kicks and such retain enough crispness to keep the mood coasting along. The dialogue has occasional hollow or flat moments, usually in more complex sound environments (like in the ring), but for the majority the synergy of sports aural energy here remains full-bodied and winning. The lump sum of the supplements amounts to roughly thirty minutes of expected press-kit material comprised of a series of brief featurettes, where sassy, appreciative interviews mix with behind- the-scenes shots that correlate with what James, Coraci, and the others are discussing. Here Comes the Cast (6:24, HD) touches on the individual cast members and what they bring to the production, which covers how Kevin James got to know MAA fighter Bas Rutten and what it's like to work with Henry Winkler. 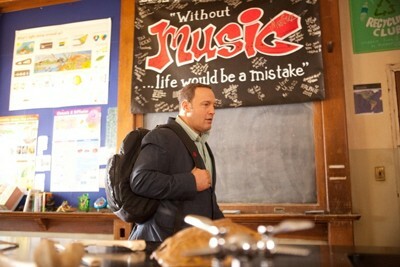 More interesting is the Back to School (4:27, HD) piece, which discusses how Coraci and his production crew utilized an abandoned school for the shoot. Three Amigos (5:39, HD) touches on the synergy between Henry Winkler, Bas Rutten, and Muay Thai boxer Mark DellaGrotte, and The Pros (3:00, HD) briefly glosses over the true fighters and trainers featured in the film. Easily the best of the features is Learning How to Fight (8:48, HD): while relatively short, this piece shows off how Kevin James trained for the role and where his fascination for the sport derives, focusing on how his technique developed with real trainers (including Mark DellaGrotte himself) and how adept he'd be in the arena otherwise. It makes a pretty solid case for James potentially being able to get at least partially as far as he does in the film, while also emphasizing the actor's dedication to both the role and his physical health. Two fun, throwaway bits, Gino Vs. Richie (3:49, HD)and Disco Street Fighting (2:05, HD), polish off the stock supplemental content with a touch of humor, while a healthy array of Deleted Scenes (16:18, HD), many of which were wise cuts, and a Gag Reel (2:36) offer a decent way to carry the laughs over after the film finishes. Finally, an Ultraviolet voucher for the film has also been included. 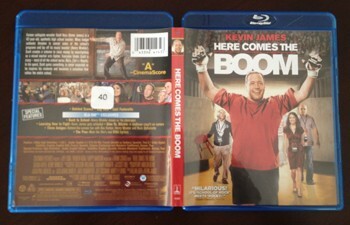 As advertised, Here Comes the Boom features Kevin James throwing himself in the ring for the sake of extracurricular activities, taking the sports-comedy formula and giving it a stiffer upper lip. The results aren't too shabby; while it can't find a stable perspective among slapstick humor, uplifting purpose, and personal drama, it succeeds barely enough in all those categories to make Scott Voss' weathered time in the ring an amusing one that's not without some heart. Between watching the occasionally hard-hitting brawls and the straight-faced Waterboy-meets-Warrior framework, coupled with Sony's diligent audiovisual prowess in the Blu-ray arena, it's certainly likable enough for a Rental.